I’m square in the middle of a first world problem. With the 2012 riding season beginning in fits and starts, the state of the fleet has me thinking very seriously about buying a modern motorcycle. I’m even considering taking the depreciation hit and buying new. Here’s why. In my fleet of old Hondas, I’m basically two for four. The CM400 is flawless, and the CB750 is running great, although I’m trying to chase down why the neutral light and oil light don’t work on the 750. My GL1100, on the other hand, is stone dead with an electrical issue. It appears to be a starter relay, but tests are ongoing. Then my CB450 is still in Minnesota in the capable hands of the boys from BlueCat Motors. While I’m confident the GL will soon be sorted and that the CB450 will be well worth the wait, the frustration of last season is still very fresh in my mind. As I said in my 2011 retrospective post, I spent 2011 doing a lot more wrenching than I did riding. While I am eternally grateful for the mechanical experience I now have, I didn’t get into motorcycles just so I could work on them. I want to ride, dammit! While I am still confident in my belief that older motorcycles, and especially Hondas, are able to be reliable, I just haven’t had that experience on a machine of my own yet. 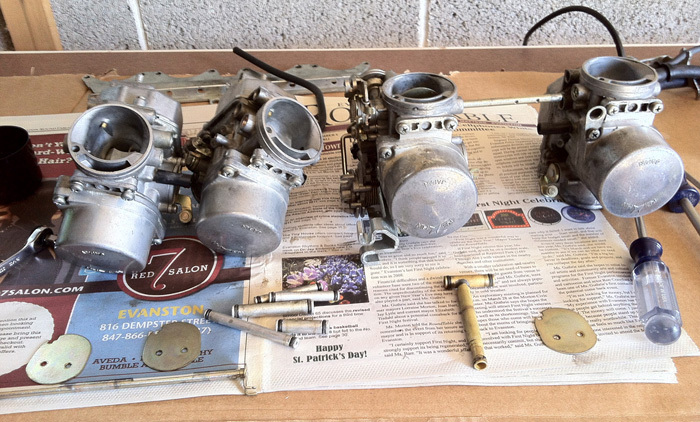 Sure, The Mrs’s CM400 has been wonderful since getting its head gasket replaced and its carbs rebuilt. Zero issues and a fun little bike to boot. I’ve got the CB750 to a point where I’ve rebuilt, fixed, replaced and repaired so much of it, there’s little else left that could go wrong with it. However, I don’t like that motorcycle. Brilliant as it is, the inline four is just not my style. It was always the plan to sell the CB750. Once the oil and neutral light is either sorted out or found to be beyond my mending, that’s exactly what will happen. Which leaves me thinking very serious thoughts about having one modern motorcycle in my fleet. I’ll continue to tinker with and customize the GL1100, but I simply don’t want a repeat of last season where I spent all my time just trying to make one of my three project bikes run well enough and long enough that I could trust it as my daily rider. I want one project bike and then something else I can actually just hop on and ride. Something with fuel injection, modern brakes and brand new wiring in it. Something that’s not due for tires or a clutch rebuild. After last year, I’m willing to pay the premium to have something I can just walk up to and start. Something that needs nothing but oil changes and gas for a few years. Something I could take on a day trip without breaking down. When the old stuff works, it’s terrifically satisfying. Putting this CB750 back together after it sat for so many years was a thrill. Finding the right solution to a problem and hearing the bike fire up and run is a great feeling that is more gratifying than almost anything else I do regularly. However, I want to work on bikes and ride them. The troughs of this roller coaster ride are when the machines refuse to run and solutions evade me — always encouraging my darker angels in their opinion that I really have no idea what I’m doing. Or worse, when it’s a seemingly endless string of malfunctions and mechanical failures conspiring to keep a machine off the road. It’s not the old bike’s fault though. It’s an old thing trying to have a place in a new world. So I think it’s time for a change. I think it’s time to stop trying to rely on bikes that simply aren’t finished being restored. It’s time to inject some modernity into my garage. The question is, which modern motorcycle should I spend my money on? I have a couple of ideas.